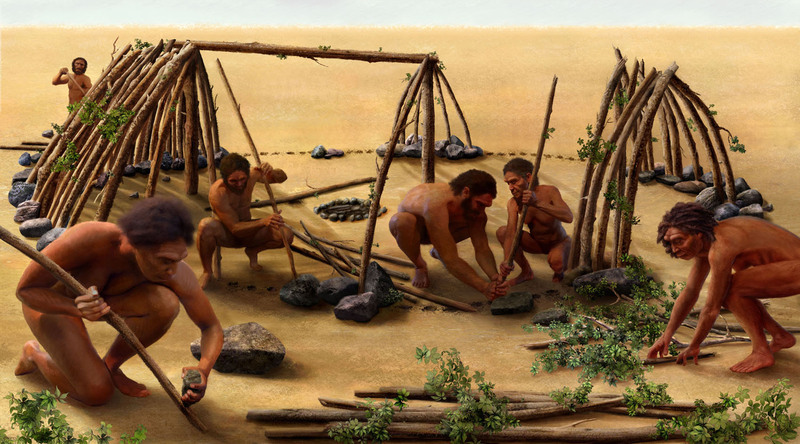 Social bonds helped ensure humans' survival. 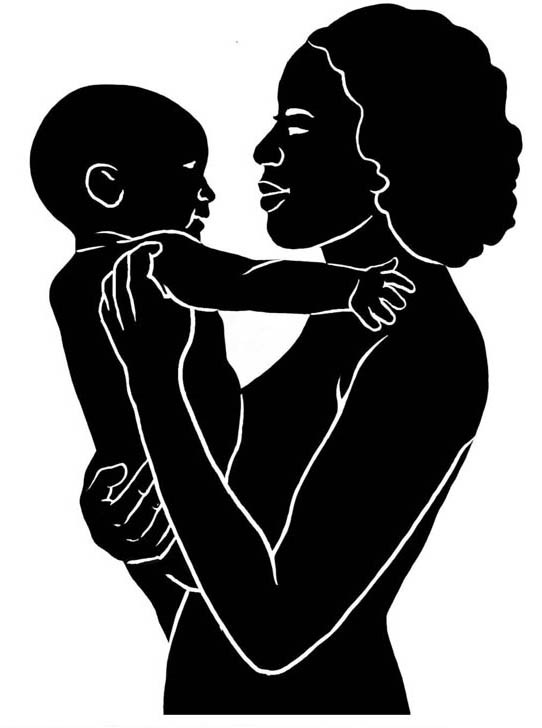 Sharing food, caring for infants, and building social networks helped our ancestors meet the daily challenges of their environments. Some groups of early humans began collecting tools and food from a variety of places and bringing them to favored resting and eating spots. Sharing vital resources with other members of the group led to stronger social bonds and enhanced the group’s chances of survival. About 2 million years ago, early humans transported stone up to 12 km (7 mi) to a site at Kanjera, Kenya. There they made stone tools for butchering animals. Smithsonian scientists, working at Kanjera with colleagues from Kenya and the United States, have excavated stone tools and butchered animal bones. How Do We Know Tools Were Transported? Different rock types have different chemical compositions. Stone tools excavated from Kanjera chemically match rocks found at natural sources up to 12 km (7 mi) away. Early humans carried the tools from these distant places, probably stopping and using them along the way. Burned flint from the 790,000 year old site of Gesher Benot Ya'aquov, Israel. During this time period, at Gesher Benot Ya’aqov in Israel, early humans gathered around campfires that they made and controlled. Why did they come together at these early hearths? -Perhaps to socialize, to find comfort and warmth, to share food and information, and to find safety from predators. 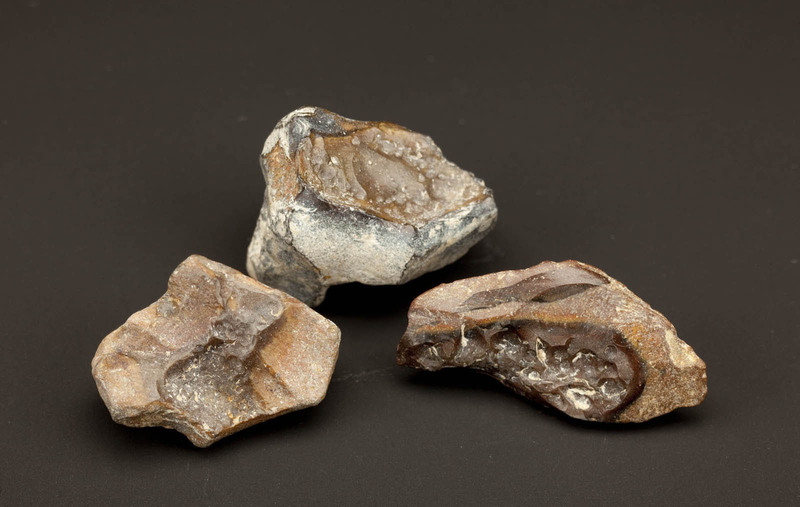 A close look at the tiny pieces of flint in this photograph reveals that the flint has been deformed by fire—evidence of fire-making at Gesher Benot Ya’aqov 790,000 years ago. How Do We Know These Were Hearths? Scientists found debris from stone tool-making that had been scorched by fire at Gesher Benot-Ya’aqov. Close by were concentrations of burned seeds and wood, marking the location of early hearths. More than a dozen hearths, dating back 790,000 years, have been found at the excavation site. By this time, early humans had evolved much larger brains. Infants were born with small brains, enabling the head to pass through the birth canal. The brain continued to grow throughout a long childhood. During adolescence, youngsters continued to prepare for the challenges of adulthood. Humans are unique among primates in having long, distinct periods of childhood and adolescence. These stages enable us to learn, play, socialize, and absorb important experiences prior to adulthood. During childhood, human children depend on adults for food and care. During adolescence, a growth spurt occurs, and male and female body features develop. How Do We Know How Long It Took to Grow Up? As teeth develop, new enamel layers form daily. Scientists used CT-scanning to count the enamel layers on teeth of a Homo sapiens child who lived in northern Africa 160,000 years ago. The layers show that the teeth were growing and erupting at the same rate as those of seven- to eight-year-old children today, telling us that this fossil human child was growing at the same rate as living humans. A microscope photo showed scientists the enamel layers on one of the teeth. By counting them, they calculated the length of this individual’s childhood. This 400,000-year-old shelter at Terra Amata, France, provided protection for an early human family or social group. Scientists found post holes and other evidence of multiple shelters at this site. Some shelters were as long as 14.9 m (49 ft.). Scientists also found fossil human feces here. They contain pollen from plants that blossom in late spring and early summer, indicating when humans occupied the shelters. Over time, humans began interacting with social groups located far from their own. By 130,000 years ago, groups who lived 300 km (186 mi) apart were exchanging resources. Social networks continued to expand and become more complex. Today, people from around the globe rely on one another for information and goods. How many groups do you belong to? Modern humans are part of many communities that encourage sharing and cooperation, sometimes among people who have never even met. These alliances enrich our lives and enable us to share expertise and the risks of survival. They can also pose serious conflicts among people of different communities. 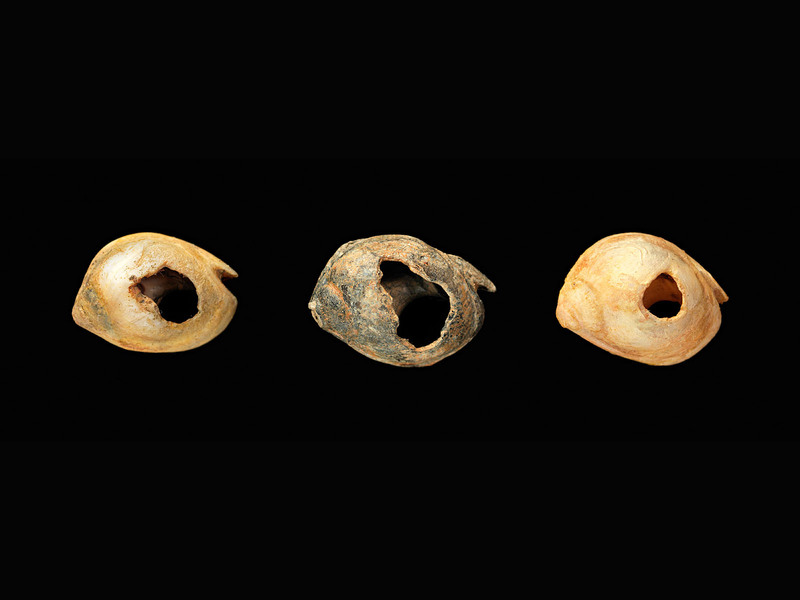 <i>Nassarius gibbosulus/<i> shell beads found at Grotte des Pigeons, Taforalt, Morocco, about 82,000 years old, transported more than 40 km (25 mi). These and other shells and shell beads were discovered far from the seas where they originated. By 40,000 years ago, humans were transporting decorative shells—and perhaps trading them—over areas of more than 500 km (310 mi). Through expanded social networks like these, humans increased their access to resources and thus their ability to survive. These two young children, born about 3 million years apart, grew up at very different rates. As childhood lengthened, parents devoted more time and energy to caring for the young. A CT-scan showed small canine teeth forming in the skull, telling us this individual was female. Her baby teeth had erupted in a pattern similar to a three-year-old chimpanzee’s. But her brain size indicates that a human growth rate was evolving. The leg bones of this child are about the same length as those of a modern two-year-old, indicating that this young Neanderthal was growing at a modern human rate, with a long childhood. 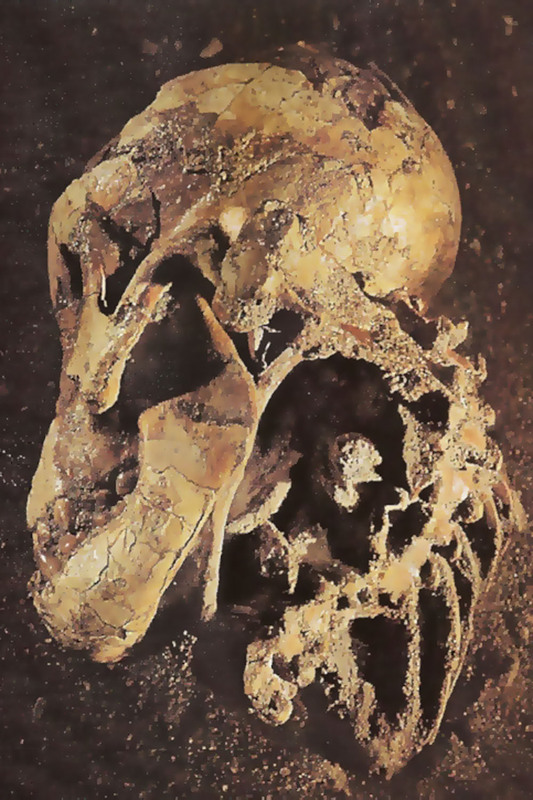 Scientists found this skeleton of a two-year-old Neanderthal lying on its back in a deep burial pit inside a cave, with a slab of limestone at the top of the head.